Scott Olson/Getty ImagesUS President Donald Trump participates in a round-table discussion with business leaders at Northeast Iowa Community College on July 26, 2018 in Peosta, Iowa. The strain of low commodity prices on farmers and ranchers has been compounded by tariffs, Ron Wirtz, regional director for the central bank, said in the report. 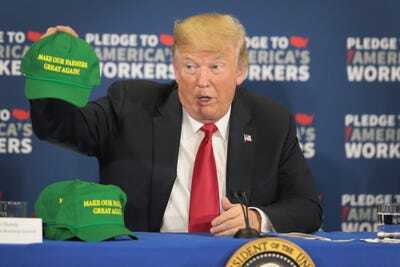 Trump has placed tariffs on more than $US300 billion worth of imports to date and threatened his policies could further escalate on multiple fronts.